One of the things about running that most appeals to those beginning their fitness journey is how little training it takes. Individuals of just about any fitness level can start running outside or on a fitness center treadmill since, next to walking, it’s one of the most natural movements your body makes. There’s no right or wrong way to do it…or is there? 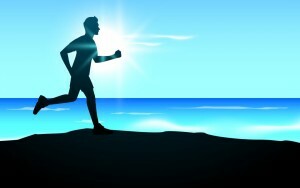 In many cases, your body will just ‘know’ how to run, and the more you do it, the more your form will naturally improve. On the other hand, one or more errors in your posture, stride length, alignment, and other bio-mechanics could be decreasing your running efficiency (i.e., speed), leaving you achy and tired after every run, and lead to chronic injuries. If you want to run long-term, you need to practice good running form. The following tips are far from exhaustive, but cover the main areas to address for the most improvements in efficiency and injury prevention. 1. Stride Length: Short and Quick. Beginners often make the mistake of lengthening their stride, expecting it to improve their speed. This couldn’t be further from the truth. Most experts agree the ideal strides-per-minute is 180. Have you ever counted your strides before? An easy way to do it is to count your steps for fifteen seconds and multiply it by four. The concept behind short, quick steps is that the longer your feet are on the pavement (or treadmill, if you run at a health club), the more energy it takes to lift them back up and propel yourself forward. Generally, the longer your strides, the slower you’ll run. Many experts say that whether you heel, mid, or forefoot strike is really not that important (although a large body of minimalist/barefoot runners would beg to differ) as long as your feet are striking the ground directly under your body. Running with this alignment naturally encourages a mid or forefoot strike, as it is. Throwing your foot forward and striking in front of your hips decreases the power of your strides and places more stress on your joints. 3. Posture: Upright But Not Rigid. Posture really is important to many forms of exercise, and especially while running. The perfect ‘lean’ pictured in many running photos is not a contradiction to good posture: these runners are leaning from their ankles, not their hips. This encourages forward motion and still keeps the body in line. Leaning too far forward is bad, but so is running too rigidly. Your entire body should feel relaxed and comfortable, with your shoulders and head up. 4. Upper Body Movement: Watch the Arms. Many beginning runners don’t know what to do with their arms, and don’t think they’re important. In actuality, your arms provide momentum that either improves speed or wastes energy. If you run in fitness clubs, you’ll see everything from ‘pterodactyl arms’ to loose, jelly arms. Besides providing entertainment, these arm movements do not improve efficiency. It may feel awkward at first, but practice positioning your elbows at a 90° angle. Your hands should be loose and relaxed and swing in a natural motion below your chest without punching forward or crossing over the center of your body. All of the previous tips apply when running up or down hills, but it’s especially important to resist gravity. Running downhill without control can cause over-striding and an unnecessarily forceful impact to your feet, legs, and up through your hips. Focus on keeping your ‘nose over your toes’ and landing softly. On the way up hill, resist the tendency to hunch forward. Keep your head and chest up and let your legs do the work. Following these five simple tips by gradually adjusting and improving your form will lead to better, safer running whether on a fitness gym treadmill or in the great outdoors.